Looking to increase your chances of employment, a future career in journalism or blogging, or just meet new people and undertake a fun project? 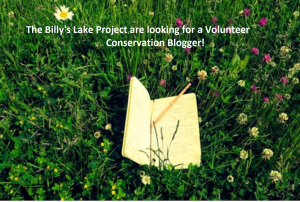 This will involve coming along to the Volunteer Working Party sessions and blogging on our website about the conservation and maintenance work that we get up to on a weekly basis at Billy’s Lake. You will get to meet friendly new people and learn new skills. We only ask that you are over 18 and have excellent writing skills and an eye for photography. If you are interested contact the Community Conservation Officer at the Acorn Centre on 023 92258423.